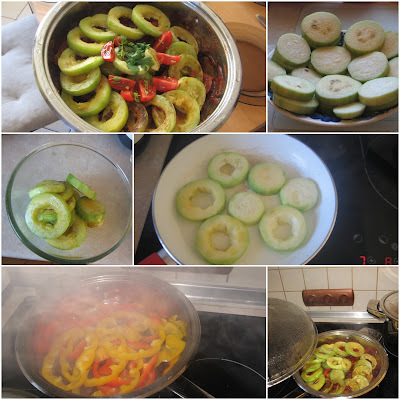 This is a recipe of my friend Wanda who asked me to publish it on my blog. Enjoy the tasty pictures - it's something I only can do since we are living in different countries and I had no chance to try the dish. Peel the zucchinis (if you take young ones, you can skip this step). Cut them in pieces of 1/2" (1 cm). Salt them and leave them aside for a while until the juice will pour out. Oil a pan and add the bell peppers, onion and garlic. Add the tomato paste and the red wine. Cover the pan with a lid and stew it on small power. Take a second pan and oil it. Roast the zucchinis. Put the roasted zucchinis over the bell peppers in the second pan. Garnish the dish with the fresh tomatoes and basil.